Applications for AI and machine learning have blossomed recently in the medical and healthcare sectors, providing new opportunities and possibilities across everything from medical image recognition to rearch and diagnostics. While covering this vast territory in brief is impossible, a small sample of current developments and thinking in this area is helpful in understanding the current state of AI. Healthcare is one of several vertical industries that we will look at in this series, as we explore the ongoing issues when AI technologies are incorporated into businesses, studies, and lives. The videos are a mixture of presentations, seminars and discussions avaialable under standard YouTube license, with landing page descriptions added. Minor edits have been made where necessary. In various medical fields and healthcare, we are facing an astonishingly serious problem—that is, we are drowning in heterogeneous patient data while starving for expert knowledge for interpretations. To assist medical practitioners for detecting, diagnosing, and treating various medical conditions, groups of computer science researchers combine domain experts’ intelligence with artificial intelligence by building computational models for the Big Medical Data available. This video demonstrates the research and applications of artificial intelligence by showcasing three applications domains, including dermatology, cardiology, and psychology. By Xuan Guo , Akshay Arun , Prashnna Gyawali , Sandesh Ghimire , Erin Coppola, Omar Gharbia , Jwala Dhamala. Rochester Institute of Technology. Researchers at Mass General Hospital are using artificial intelligence and deep learning to advance patient care. Beth Israel Deaconess Medical Center, Harvard Medical School. Following up on the previous post about AI and robotics in agriculture (Agricultural Robots and AI in Farming; Promises and Concerns), it seemed appropriate to provide some video on this fascinating and highly significant area. Agricultural robots face substantial challenges in handling an enormous variety of tasks; they also need to take special care in handling plants, produce, and animals. Agriculture is a critical area of development that often goes unnoticed in the Industry 4.0 story. But these solutions are exploding and are likely to have enormous effects upon employment, finance, and society. The videos are a mixture of talks, presentations, teaching material and product demonstrations available under standard YouTube license, with landing page descriptions added. Minor edits have been made where necessary. As climate change and global demographics begin to put excessive strain on the traditional farming model, the need for an agriculturally intelligent solution is vital. By 2050, the world population will increase by over 2 billion people. Current crop yields and freshwater resources will not be sufficient to sustain a population over 9 billion people. On May 15th 2017, the Machine Learning Society hosted this event to showcase high tech farming techniques used in vertical and urban farming. Our keynote speaker is Ryan Hooks of Huxley. Huxley uses computer vision, augmented reality (AR), and A.I. to greatly improve yield, while driving the down cost and resources requirements. Huxley is creating an “operating system for plants” to grow with 95% less water, 2x the speed, 2/3 less carbon output, and half the nutrients needed. Keynote presentation by Ben Chostner, VP Business Development of Blue River Technology, at the May 2016 Agri Investing Conference in Toronto. Autonomous robots created at the University of Sydney can count fruit on trees, spray weeds, and even herd cows. All pictures courtesy of Professor Salah Sukkarieh, University of Sydney, Australia. Gareth Tape of Hardisworthy Farm in Devon calls the technology ‘life-changing’ – both for him and his cows. Watch the video to find out why. While still a student, Shunji Sugaya started an IT company focused on artificial intelligence and robots for use on the farms of the future. Agriculture in Japan faces serious challenges like an aging population and shrinking workforce. Sugaya imagines robots and drones that reduce labor demands and farms that are run using big data. Today we look at Sugaya and the young engineers at his company in their efforts to shape the future of agriculture and fishing with cutting-edge technology. Getting down to the nitty-gritty, it’s time to take a practical view of what is involved in setting up Machine Learning (ML) projects. There is a lot of material available, but it can be difficult to find accessible information that can guide you through the development and implementation maze. Here we look at how to access ML APIs, how to use TensorFlow, and common algorithms that you might wish to use for various purposes. A more practical understanding gives you an edge in discussing possbilities, as also heading you toward the right track if you wish to add these skills to your programming arsenal. The videos are a mixture of talks, presentations and teaching material available under standard YouTube license, with landing page descriptions added. Minor edits have been made where necessary. Six lines of Python is all it takes to write your first machine learning program! In this episode, we’ll briefly introduce what machine learning is and why it’s important. Then, we’ll follow a recipe for supervised learning (a technique to create a classifier from examples) and code it up. With TensorFlow, deep machine learning transitions from an area of research to mainstream software engineering. In this video, Martin Gorner demonstrates how to construct and train a neural network that recognises handwritten digits. Along the way, he’ll describe some “tricks of the trade” used in neural network design, and finally, he’ll bring the recognition accuracy of his model above 99%. Content applies to software developers of all levels. Experienced machine learning enthusiasts, this video will introduce you to TensorFlow through well known models such as dense and convolutional networks. This is an intense technical video designed to help beginners in machine learning ramp up quickly. Deep learning has already revolutionized machine learning research, but it hasn’t been broadly accessible to many developers. In this video, Martin Gorner explores the possibilities of recurrent neural networks by building a language model in TensorFlow. What this model can do will impress you. Developers with no prior machine learning experience are welcome. We do recommend that you watch the previous video unless you already know about dense and convolutional networks and are only interested in recurrent networks. This is an intense technical video designed to help beginners in machine learning ramp up quickly. While the general integration of artificial intelligence into business processes is likely to have a profound effect, one area common to all applications will be particularly impacted–the User Interface (UI). We have already seen the beginning of AI in digital assistants such as Alexa (see Digital Assistants Coming of Age with Alexa) that interpret natural language commands and respond with speech or actions. While this type of Conversational Interface (CI) is likely to become ubiquitous, there are other significant UI impacts that may be at least as important. Today, capabilities of applications have grown geometrically and complexity continues to increase. Meanwhile, mobile platforms have limited display space and fewer controls. This leads to a new need for simplification. The choices presented to the user in menu upon menu within office products, for example can be exhaustive and make it difficult to locate specific actions. Yet there is great demand for additional processing to meet the needs of new use cases. Natural language processing provides a start for simplifying access to the deeper complexities of programs by understanding commands and responding without a keyboard. But the conversational interface is also evolving as AI progresses. We are still at a rudimentary stage, returning to the need to memorize commands like the old TTY interfaces. What is needed is to address the selection of actions based upon context. This is the beginning of a new form of interface in which AI is able to translate a human request for a desired result into a command sequence to one or more applications to perform tasks that will meet the user’s ultimate goal. For example, someone might ask “Should I go to the office today?”. The system might then assess health information, determine if there is an illness; check the weather for extremes; check databases of current natural disasters that might be applicable; check holiday schedules; check company instructions and so forth, all in an instant. But to do this, the AI needs a broader range of knowledge and data than is commonly available for current AI applications, and a capacity to understand what such a request might entail. In fact, as with many such puzzles, there is the beginnings of a requirement for an artificial general intelligence which would think across a wide range of territory rather than within the simple parameters of a question. The AI would think about thinking. Such an interface demands situational awareness and an understanding of the overall context in which a question is posed. The AI needs to define the specifics of where information would be found; it also needs to understand how to convey and/or act upon that intelligence, and make complex choices. As software continues to grow in complexity, it is certain that AI will provide a bridging interface between human and machine. This interface will become more flexible and more powerful, and it will evolve to perform more duties. Just as simplification of the UI makes it possible to perform complex tasks on the computer with only a basic understanding of operating principles, people will begin to interact with computers in a conversational way and evolve information requests to meet an increasingly sophisticated interaction. The growing sophistication of this interaction and will feed the development of further AI UI capabilities. Development of a sophisticated AI-based UI is not solely about natural language processing, however. All computer interactions can likely be improved by the addition of an AI layer. While conversation is a priority, AI will be able to to reduce the clutter and confusion of menu-based interactions by providing selection based upon context, and capability to interact based on desired results rather than tool selection. In effect, this is much like movements in software development, such as the growing Agile and DevOps movements. Writing software to meet specific customer needs is much better than coding based around technology. This same rule must apply to the actions of programs themselves. AI will also be applied to the processes of developing artificial intelligence. We have already seen programs that read a user interface screen image and convert it directly into code. In the next iteration, we can expect to see AI solutions which turn actions into instructions which may feed multiple AI systems to further a desired operation. While such a general intelligence creates its own issues, it will arrived in incremental steps. Increasing complexity of AI routines, increasing integration, and increasing componentization will open the way for AI to operate across a broader range of data and make decisions about thinking and about interaction that can generally be applied across all computer systems. AI and Blockchain are both topics that have generated significant interest recently as these technologies are incorporated into business processes. As with all digital technologies, however, they are not discrete. Maturing technologies often converge to develop entirely new possibilities, and blockchain combined with AI could create some potent results in fintech, accountability, and in infrastructure. The following videos look at this potential for convergence from several perspectives. The fields of Blockchain and Artificial Intelligence are converging, and they will intersect soon. Artificial Intelligence and Machine Learning require vast amounts of data. That’s how they learn. Meanwhile, Blockchain allows for decentralized autonomous organizations which will soon involve hundreds of millions of people. Furthermore, platforms built on Blockchain technology will soon be powerful enough to support AI applications. At that point, AI could evolve very quickly and become, effectively, an unstoppable utility for the world’s population. No one knows exactly how this convergence will play out. Certainly, I do not either, but I know this is an exciting time and I plan on following the developments as they emerge. The results will most definitely affect us all. This talk by Trent McConaghy describes the various ways in which emerging blockchain technologies can be helpful for machine learning / artificial intelligence work, from audit trails on data to decentralized model exchanges. In recent years, big data has transformed AI, to an almost unreasonable level. Now, blockchain technology could transform AI too, in its own particular ways. Some applications of blockchains to AI are mundane yet useful, like audit trails on AI models. Some appear almost unreasonable, like AI that can own itself — AI DAOs (decentralized autonomous organizations) leading to the first AI millionaires. All of them are opportunities. Blockchain technologies — especially planet-scale ones — can help realize some long-standing dreams of AI and data folks. Numerai Founder Richard Craib discusses his radical project to build a hedge fund with network effects. Numerai manages its portfolio by giving its data in encrypted form to data scientists who compete to create the best predictions and get paid with cryptocurrencies. Numerai expects to radically alter the structure of the hedge fund and asset management industry. A presentation by Adam Kolber (Brooklyn Law School) from The Ethics of Artificial Intelligence conference that took place October 14-15, 2016. It was hosted by the NYU Center for Bioethics in conjunction with the NYU Center for Mind, Brain and Consciousness. Published by Livestream.com. Creativity has always been a particular challenge to AI, and many have suggested that it will be a key differentiator between robotic capabilties and human. However, as we approach a deeper understanding of machine intelligence and intelligence in general, we need to refine our understanding of creativity. With innovation being a critical business requirement based on creative thought, developing a better model of AI creative processes and their implications is likely to become increasingly important. At the present time, machine creativity is very limited. This does not mean that it will always be so. Following is a set of videos looking at various approaches to the intersection of creativity, AI, and robotics. The videos are a mixture of talks and teaching material available under standard YouTube license, with landing page descriptions added. Minor edits have been made where necessary. Blaise Agüera y Arcas, principal scientist at Google, works with deep neural networks for machine perception and distributed learning. In this captivating demo, he shows how neural nets trained to recognize images can be run in reverse, to generate them. The results: spectacular, hallucinatory collages (and poems!) that defy categorization. A partial lesson by Gil Weinberg, with animation by TOGETHER. People have been grappling with the question of artificial creativity — alongside the question of artificial intelligence — for over 170 years. 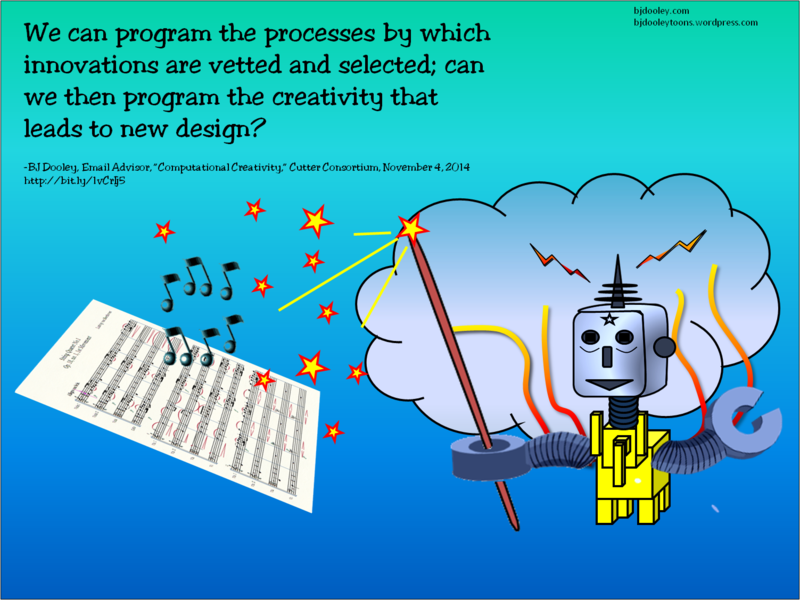 For instance, could we program machines to create high quality original music? And if we do, is it the machine or the programmer that exhibits creativity? Gil Weinberg investigates this creative conundrum. In a quest to understand the role of artificial intelligence (AI) in advertising, The Drum, in partnership with Teads, has unveiled a new documentary, The Automation of Creativity, shot in Tokyo, London and Amsterdam. The 16-minute film explores how artificial intelligence is beginning to impact the creativity of advertising and the role of human creatives. To date, artificial intelligence (AI) machines have been able to write poetry, drive cars and there is even talk of a machine possibly winning a Pulitzer one day. Turning the focus on the ad industry, The Automation of Creativity film stars the world’s first artificial intelligence creative director, AI-CD ß, launched by McCann Erickson Japan. You’re probably reading this from either a smartphone or a laptop. It’s no small secret that the device you’re looking at can create works of art… if you put your mind to it. But therein lies the point that Andrew McAfee makes in this video: you need to put your own creativity into the computer for it to work. Interestingly enough, computers are pretty adept at creating architecture and music. This is largely because what is pleasing to the quote-unquote “Western aesthetic mind” is easy to replicate. Music follows a formula, as does pleasing architecture and design. But when AI tries to replicate the human condition, or relate in any way to emotions and feelings, that is where even the smartest computer brains fails. Great news for all us writers out there. Not so great for all the graphic designers, though!